One of the things on my bucket list this year is to buy new clothes for my husband and myself. That’s because Vince and I buy clothes just for the kids. I’m sure my mama readers know this! We always buy the kids’ things first and if there’s any budget left, then we shop for ourselves, right? Thing is, for the past so many years, even when there’s shopping money, Vince and I would rather buy experiences—we’d buy books and games, watch movies, try out a new restaurant, go on staycations—than buy clothes for us. After all, we stay the same size anyway (well, aside from the three times I was pregnant!) so there’s no urgent need to get a new wardrobe. So I’m going to share with you a few tips on how I keep our clothes looking new! 1. Wash clothes inside out. It’s an extra step, I know, but I really believe that when the outside of the clothes are protected from the friction caused by washing, the clothes last longer. Buttons, embroidery, patches, designs. The only pieces I don’t do this to are jeans because jeans are supposed to fade. 2. Don’t use hot water. My fantabulous Electrolux front-loading washing machine is my favorite appliance. It has so many functions that I can access through its computerized panel. So sophisticated! I noticed that its washing modes always use hot water. Hot water expands color molecules, resulting to fading of colors faster. So when I wash our colored clothes, I always adjust the wash modes to cold wash. The only time I don’t do this is with the whites. 3. Use a good laundry detergent. I use Ariel, which really gets into those stains. That means I don’t have to use bleach on colored clothes and scrub at stubborn stains (scrubbing damages the material). But I make babad whites in bleach. It not only whitens whites but also kills germs in your washing machine. I’ve always used Downy Anti-Bac. That’s the anti-bacterial variant. Because it kills odor-causing bacteria, the clothes smell fresh longer and we can wear them for more than a day. I know that sounds gross but my husband and I work from home, with the A/C on all day, too, so we hardly ever sweat! And, of course, I also believe in how fabric conditioner protects threads and strands from fraying and elastics from stretching too much. I also read somewhere that Downy specifically has Color Protection Technology, so colors won't fade even after lots of washes. And I know it works because a lot of our clothes are at least 5 years old and they don't look faded and worn at all. 5. Dry in a windy—not sunny—area. I grew up being told that freshly laundered clothes need to hang on a clothesline under the sun. This is how you kill germs, I was told. But I also know from my science classes that nothing is worse on color than the sun! The sun bleaches colors away! So, since I live in a condo with a big utility area, I always hang our clothes with the whites near the windows (whites are good with being sun-bleached!) and the colored clothes at the back. Thankfully, the big windows let in a lot of wind so the clothes dry real quick. 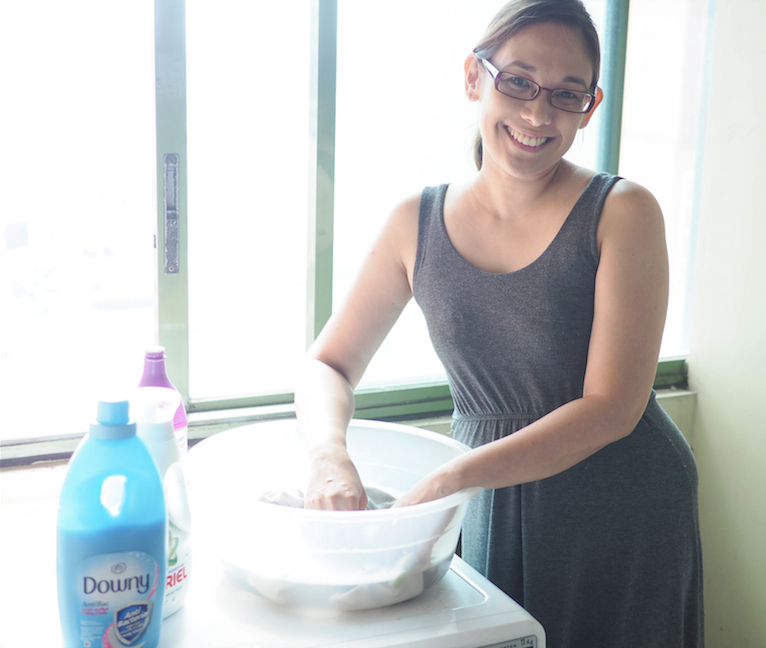 Plus, fabric conditioner makes clothes dry faster so there’s no “kulob” smell even now when it’s the rainy season. As for killing germs, well, it helps that the Downy variant I use is already an anti-bacterial! 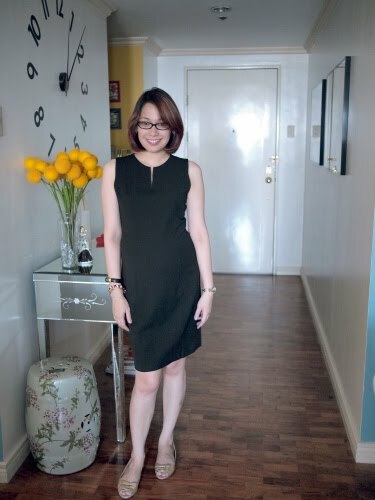 Let me show you my favorite black dress, which I've had for almost a decade now. The black is still very black and the fit is still amazing—it hasn't loosened and neither has it gone threadbare. Alagang-alaga! Dress still looks good years after! So those are my simple steps to keeping our clothes looking like new! Do you do the same things, mamas? Thanks and happy weekend! UPDATE! Hi to all the mommies who are dropping by to read this particular blog post! Thanks for making it my most popular one. I didn't realize malakas pala ang labada topic. Sige, I will write about my labada tips more =D Thanks again for reading! Great tips, so helpful! I looove black and I'd never want to give up on my basics due to color fading. Now I'll always have something that looks new (wink, wink)! Light therapy benefits on skin: Do they work? Maternity clothes now available at UNIQLO! Exercises we can do at home to get sexier!